First of all - the photos do not do this place justice. It is much more beautiful and scenic in real life ! We really enjoyed our week at the house. Is in a very quiet, beautiful part of the countryside. Completely void of tourists, but still plenty to do within a short drive. The house itself has everything you could want. The pool area is huge and amazing. Not quite warm enough for the pool when we were there, but made great use of the hot tub and other amenities including the ping pong table. The house has many sitting areas and views around the property. Great places to sit and admire the views with a glass of vino. Our 12 yr old daughter enjoyed all the extra touches that Janette & Danny have done including the trampoline, foosball table, and of course that hot tub. Also enjoyed checking the chooks for eggs each day. The local area had several hilltop villages that were worth visiting and even the ancient monastery of La Verna was not too far away and worth a visit. Couple of quick tips: Nearby restaurant of La Pieve Vecchia has beautiful reasonably priced food & wine, definitely our favourite. Also, if you are in the area on a Sunday , go to the local Monterchi market and get a porchetta roll (pork). They are delicious. Overall we had a fantastic time and would love to return one day. The house, pool, house wine and amenities are five star. The experience was a two week blend of old Tuscan and 2018 life styles; featuring wood fired cooking on the property’s many hearths to the day trips to and through the hill towns and coastal cities within an easy drive, though sometimes made interesting by highway repairs. Overall, if you want quiet and recharging this is the place; if you want touring and finding your way into the heart of ancient Tuscany for a lunch, then this is the location. We did both and to come home after a morning tour to a beautiful spa experience at the pool was the perfect “taste” of Tuscany. Dear Chuck, our only regret is that we were not in Italy at the time of your visit and did not have the opportunity to welcome you personally. Hopefully next time !! It is our great joy to be able to share our beautiful "Podere Borgacciano" and are delighted that we were able to contribute to the success of your holiday. Amazing week in this amazing villa! Sometimes the pictures on the internet make things look better than they are but this was not the case for this villa. It's hard to believe but it was even better than the pictures. The pool is beautiful with plenty of shade and the outdoor kitchen was perfect. Having Grazielle cook a pizza lunch and then a steak florentine dinner were the highlights of our trip. She and her friend couldn't have been more gracious and the homemade food was by far better than any restaurant we went to while in Italy. Sitting at the outdoor patio and looking out at the Tuscan hills while eating was truly magical. We slept each night with our windows wide open enjoying the wonderful hillside breezes. The beds were very comfortable and we appreciated that there were en suite bathrooms for each of the three bedrooms. We fed the chickens and wandered through the beautiful gardens taking in the lavender and enjoying fresh tomatoes and basil. There were six of us and we had to force ourselves to explore other parts of Italy while there as all we wanted to do was stay at the villa the whole time. Our hosts were wonderful checking in to make sure that we had everything we needed. We were so grateful for the bottle of wine, pasta and bread that were there waiting for us the first night as we got there late and were hungry. This was the highlight of many trips over the years and we're already trying to figure out when we can go back and stay longer!! Loved everything about our week in this wonderful villa!! Thank you Shelly for your glowing review. It is indeed, heart-warming for us to receive such positive feedback that all the little details we provide to welcome you and make your stay so comfortable and relaxing are greatly appreciated. We and others, over the past 23 years, have been attempting to capture the definitive photos of the breathtaking views from our villa, across the valleys and up to the Apennines. It is almost impossible to do justice to these beautiful views in a photograph - one HAS to experience them for oneself ! During our time here in Tuscany, we have, of course, visited some other fabulous villas, but we can honestly claim that none could compete with views like ours. It certainly gives us so much pleasure to know that you and your group had such a great time at "Podere Borgacciano" and Graziella will be thrilled to know how much you all enjoyed her excellent "Pizza Pranzo" and "Cena alla Fiorentina", as so many of our guests have done. We really look forward to welcoming you all back to our "Angolo di Paradiso", perhaps for a longer stay so that you can experience all that our beautiful corner of Tuscany, bordering Umbria, has to offer the discerning traveller. Hopefully, on your next visit, we look forward to meeting you all personally. Warmest regards, Janette and Danny. Possibly the best view in Italy! From the moment we arrived at the farmhouse we were blown away by the absolutely stunning scenery from the property. We described the view from the house like looking at an oil painting and it never ceased to amaze us every time we looked out of the windows at home picture postcard the view was. We were lucky enough to see, on the first evening, two deer wandering through the garden. The house itself is also stunning, with a rustic charm and immaculate fittings and furnishings its easy to see how people would fall in love with this place. The rooms are spacious, well decorated and comfortable - with air-conditioning to all of the bedrooms and mosquito nets to all of the doors and windows throughout the house. A welcome pack or tea, coffee, milk, pasta, sauce, and home baked bread was a nice touch. Quality family time. We took lots of pool games and pool inflatables with us and spent the majority of our time enjoying the fantastic pool and pool house. The location was perfect for enjoying some peace and quiet, but also perfectly positioned for exploring the surrounding picturesque towns and villages. The owners make this place a real "stand out" property. They live in the adjoining house and were there to meet us when we arrived. They gave us a tour of the house explaining everything we needed to know. Its clear to see that they are passionate about the house, gardens and local area. They were a wealth of knowledge suggesting the best places to shop, eat and visit. Genuinely lovely people who made us feel so welcome, they even invited us round to their house one evening where we enjoyed a few drinks and fascinating conversation. We'd highly recommend this house to everyone we know. Thank you Danny and Jeanette for a truly magical holiday in a location we'd love to visit again. Dear Holly, It was a pleasure for us to meet you and your lovely family and have the opportunity to spend a little time together. We are blown away by your review and are delighted that "Podere Borgacciano" came up to your expectation, against an "Oil Painting" view as a backdrop !! Looking forward to your next visit. We just had the most wonderful relaxing week at Podere Borgacciano. It is such a charming beautiful place, in a beautiful area of Italy. 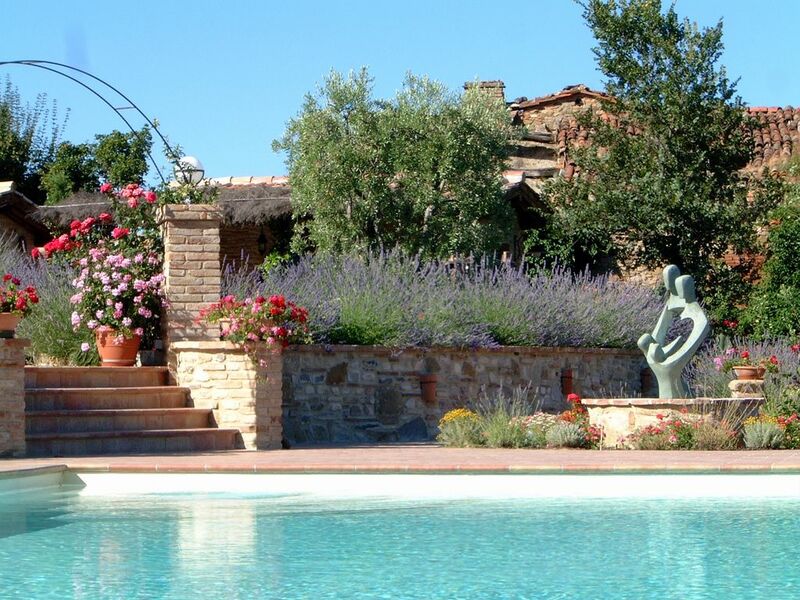 The place has the most stunning views over Tuscany to one side and Umbria to the other side. Our kids loved to go feed the chickens in the back yard and see if they had laid any eggs. The Pizza lunch made by Graziella at the outdoor kitchen by the pool was such a wonderful experience. The food was delicious, and the kids loved to see and get involved in the pizza making. We had the great pleasure of meeting Danny and Janette, who are an amazing couple. They where so welcoming and helpful, and it was so interesting to hear their story about the place. We can only give our best recommendations to the place. It is the perfect place to relax, enjoy some family time and the Italian life style. Thank you Hans Christian and Yvonne for your wonderful review of our beloved Podere Borgacciano. It was a real pleasure meeting you and your lovely children. We as so delighted that you enjoyed your holiday and had such a good time. We would love to welcome you back to our "Angolo di Paradiso" in the not to distant future. We have had the most fantastic holiday at Podere Borgacciano. We hadn't visited this area before, and had been attracted by the photographs on the listing. The photos were superb to tempt us....the reality is even more fabulous than we thought possible! We are a family of 5, having spent a week sightseeing in Rome and Florence, and so were in need of some rest and relaxation. This did not disappoint. The farmhouse is superbly laid out, very comfortable and exceptionally clean. There is air conditioning to each bedroom which was very welcome for a stay in July. The farmhouse is set over 3 floors with very generous bedrooms and an en suite to each room. The house has stunning views across the valley; the ground floor bedroom opens on to a stunning terrace and the fabulous grounds - full of the most beautiful and scented flowers. The smell of the gardens is something I'll never forget, it was wonderful. There is a selection of terraces and patio areas to enjoy - we spent our evenings sitting out watching the sunset. The grounds are well maintained, but also completely natural - with flowers, fruit brushes, olive grove and more surrounding the property. The swimming pool area is also fabulous - with its well equipped brick built kitchen area, shower and toilet, and the pizza oven and barbecue - we would spend our days there. The swimming pool is superb, an excellent size. And there is a selection of areas to enjoy - if you like the full sun, there are sun loungers around the pool; if you fancy some shade there are comfortable outdoor sofas in good shade. Our children enjoyed the table tennis table, trampoline and swings so much - and of course the hot tub was a big hit. Danny and Janette are the best hosts. They were close by when we needed anything, but also entirely private. Nothing was too much trouble, and there were plenty of details of places to visit ready for us in the house. The details of how to find the house were fantastic too, so much thought to make things easy. We enjoyed the town of Monterchi - with its lovely and friendly supermarket, pharmacy, bank and couple of restaurants, and a Sunday market. There are beautiful villages nearby - we didn't visit enough, and so gives us the perfect excuse to return! I wouldn't hesitate to recommend a stay at this superb home, a week certainly wasn't long enough. Thank you Danny and Janette, and we do hope to return! Thank you Rebecca and Nick for a truly wonderful review of our "Angolo di Paradiso"
It gives us so much pleasure when our guests love "Podere Borgacciano" as much as we have for over 23 years. Such treasured memories are created when the family enjoy great times together. If we have been able to provide the setting that create such memories, we are more than happy. You are a charming family and it was a delight to meet you. We are really looking forward to welcoming you back.